For the second year in the row I've done a storytime that celebrates poetry and rhyming books for the kids. 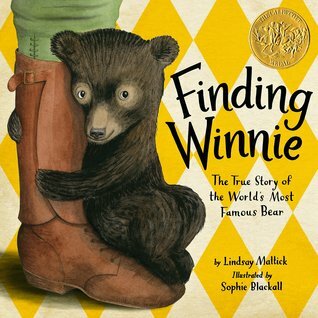 I truly wish there were more poem picture books out there in the world! The children from both programs did enjoy this theme! By the way, you'll see the pattern of me using a lot of David Elliot books. He does such nice ones that are poem picture books that I could not help myself! This was a cute book, but only some of the older toddler-level ones were able to help find out which chicken was not dancing. 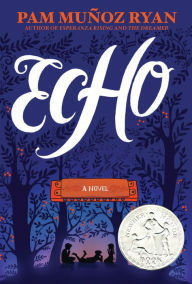 I liked this book, but I was getting tongue tied after awhile doing the "fiddle-i-fee" refrain a lot. The children liked seeing all of the different animals. The Toddlers really liked this book. The older ones in the group that it was amazing that the frog could leap so high! 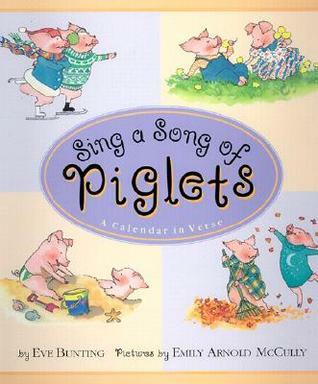 The piglets in this book are a-d-o-r-a-b-l-! I had to read the whole thing because of the cuteness factor. The girls in the group agreed with me. 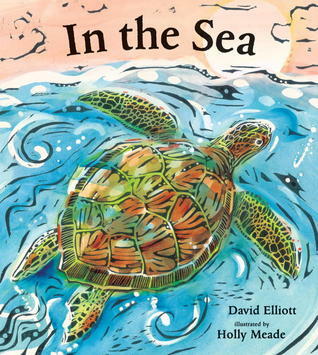 This poem picture book is like a celebration and appreciation of the world around you. I wish the Preschoolers appreciated it more than they did. Oh well, perhaps another day. 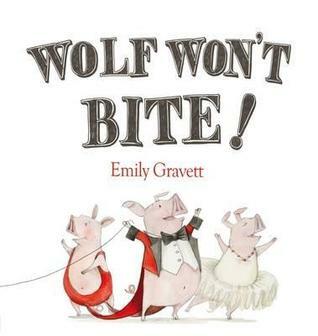 This is one of my favorite poetry picture books and one by David Elliott. The illustrations are just lovely and I enjoy a good amount of the little poems. 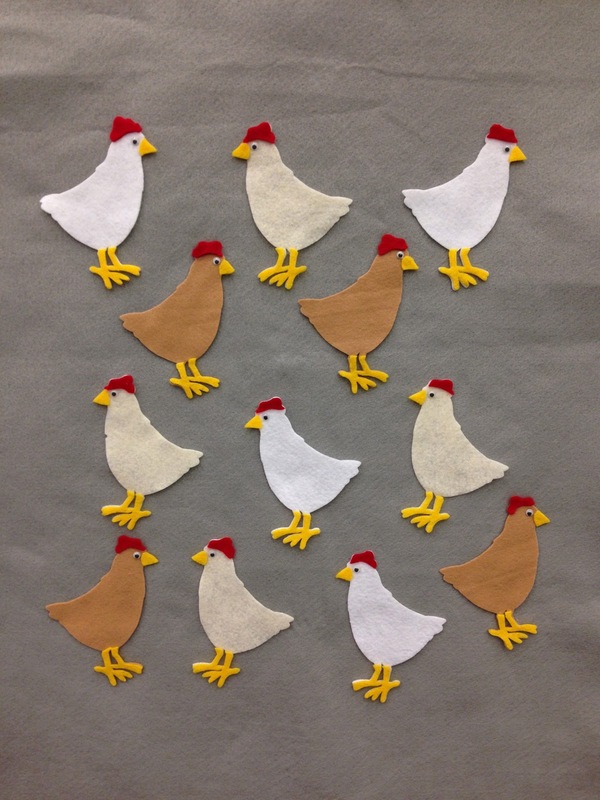 Needing some sort of flannel board to get some wiggles out I made twelve chickens with a die cut shape. To give the birds a little more dimension I used the die cutter to make their beaks and combs. 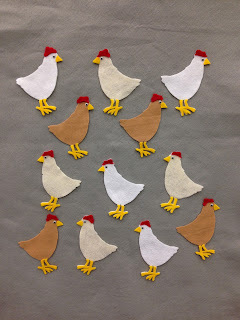 I had the Toddlers put them on board before we read the book One Little Chicken: A Counting Book. This is one of my favorite flannel boards I've made. The Starfish are so dang cute and happy looking that I actually made more than five back when I made them for a Visit Magical Places storytime! 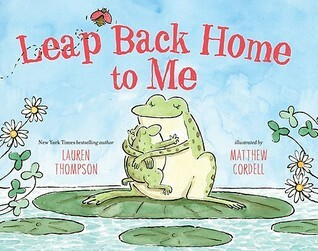 I'm so happy that the Toddlers really liked the book Leap Back Home to Me because the craft I did was inspired it. 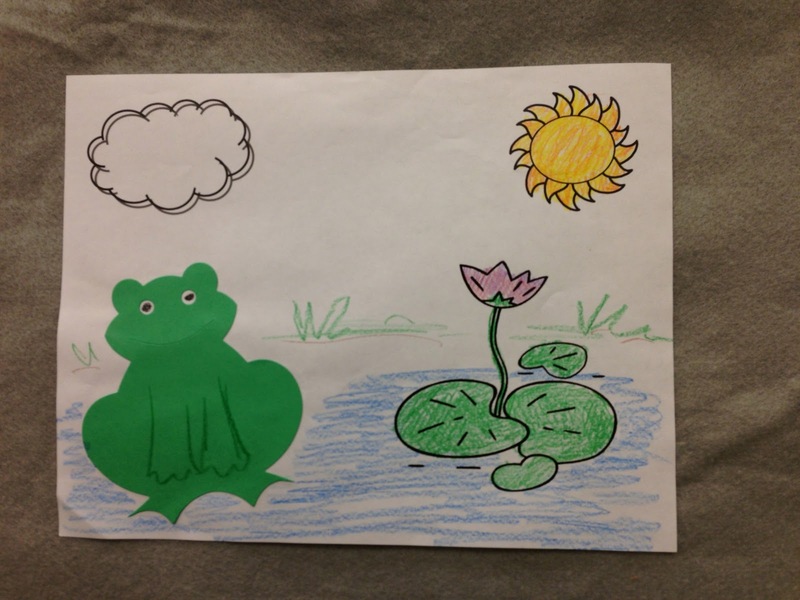 All they had to do was paste the a die cut frog onto a coloring page. Some frogs were leaping while others were relaxing their home. Mine was chilling at home. The Preschool group got to make a picture out of construction paper of a seashell either under the water on the ocean floor or on the beach. 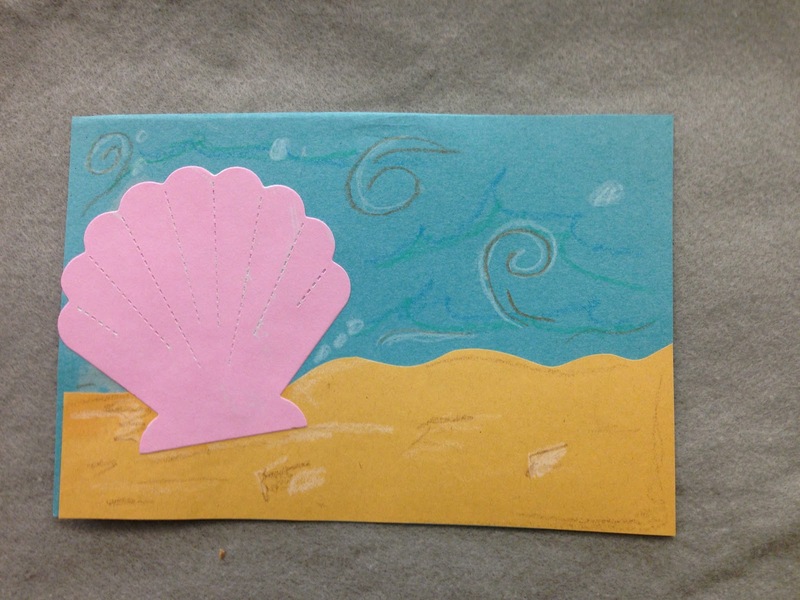 Using construction paper crayons to recreate the Holly Meade's illustrations in the book In the Sea was awesome! Love! Hedgehogs. Yes, hedgehogs. Let's all go, "Awwww!". A lot of this program was inspired by other storytime bloggers like Storytime ABC's and Notes from the Story Room because they did such a wonderful job. Thank you, ladies! I really enjoyed doing this draw-and-tell story. It was the very first thing that I did before we started the program so that the families had to guess what the program theme was. The preschoolers already had an idea because they saw one of books on the table before. The Toddlers really liked by drawing skills, and the Preschoolers were a little less than impressed. This is such a fun book. The girls in the Preschool Storytime thought it was fun to see Harriet covered in flowers. Hedgehogs: A Complete Pet Owner's Manual written by Sharon Vanderlip, D.V.M. 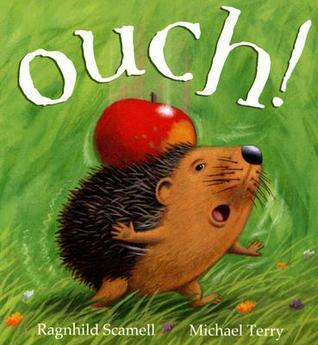 I showed this book to both groups because it had a good amount of photos of real hedgehogs. Everyone loved the little pink baby ones. Who doesn't?! 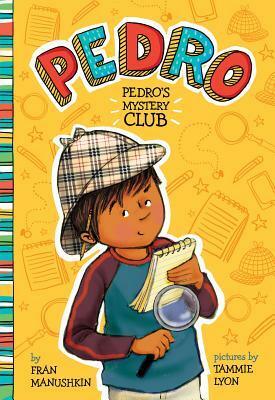 Everyone loved this book! I will need to make a flannel version of this one someday. One of our egg shakers cracked because it was being slammed into another one during our play time. Time to think about making more of them! 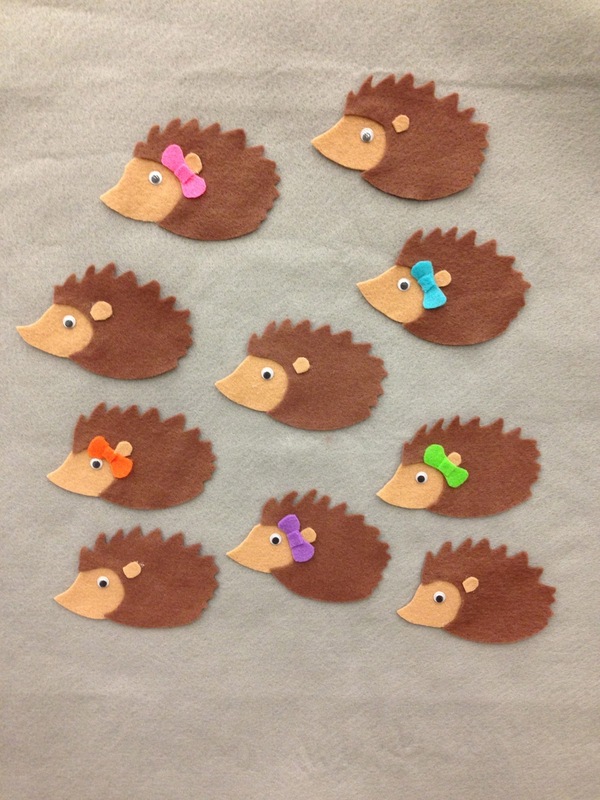 To create the template for the hedgehogs I drew my own little critter then traced it on my felt. To add some life to each one, and so that I had another activity built into the flannel board, I give five of the hedgehogs little bows to signify them as girls and the boys are regular. When we did the rhyme "Ten Little Hedgehogs" I had the children take turns and put them on the board. Then we did a little bit of math skills and we had to count how many were boys and how many were girls. Remember to ask: "If we add five boys and five girls, how many hedgehogs do we have total?" You'll find out how many already know how add. Awesome! I should make a frog flannel piece to slap on their at the for next time. 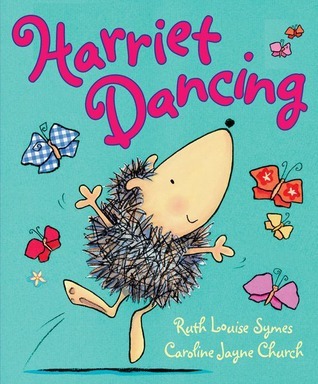 Inspired by the book Harriet Dancing we made our own dancing hedgehogs. To make the spiky part of the creature I actually used a die cut for a patch of grass. I will call myself a creative genius now. For the little head/body I basically cut out little bean shapes with a swoop for the nose. Each child also got flowers they could add to their page. For those who wanted them there were also little red bows too. Mine is enjoying a little ukulele music. And it was a circus! Literally! The public schools were out for the day and so there was a good influx in attendance, especially in Preschool Storytime. 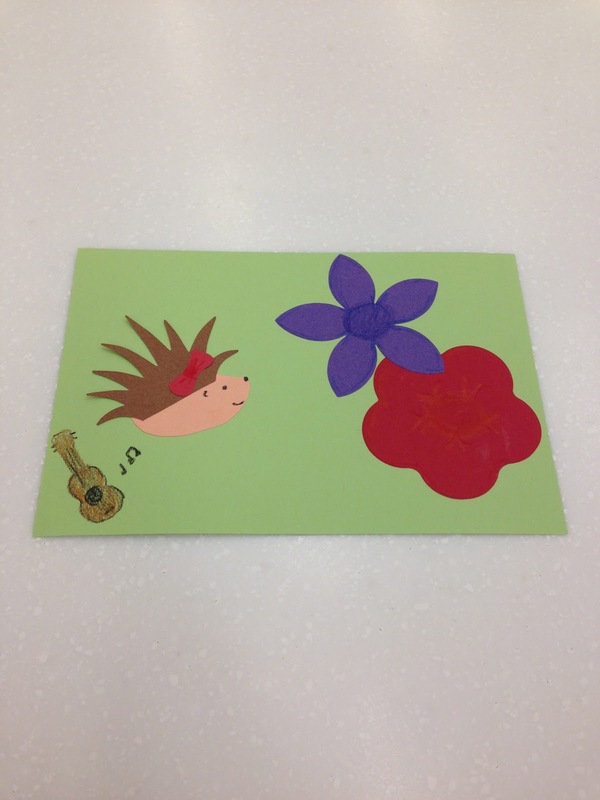 This storytime was a lot of fun because of theme and because the Toddlers LOVED their program. But it was also one of the toughest. All storytime librarians know that every so often a new child comes to storytime as shy as can be, and you make them feel welcome and to encourage them to have fun. Then it kinda backfires. The child opens up to being a very curious self that requires constant attention and answers to questions during the program. Everything that is normally hidden behind an easel is found in the middle of a story, which is also when you see that the caregiver is at the back of the room and is voluntarily immobile and mute. Knowing the condition of the child also makes you realize that cannot be nice but stern with the child because it would cause a breakdown in the middle of the program. Tough Preschool Storytime. I love a child with a curiosity, but I also love a child when there is an adult who help him/her understand the ways of behaving in storytime. Lesson learned: brush up on those authority figure skills. Now, onto this fun storytime theme. 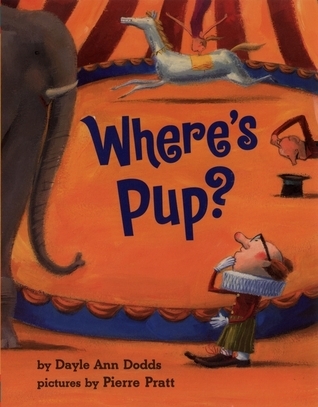 The toddlers loved this book and would help me ask "but where is pup?" with adorable question-faces. This was fun book, but I decided that I'm not a huge fan of the color choices. I love the illustrations of this book. The kids were dead-set on the wolf was going to bite those cute piggies at any minute. 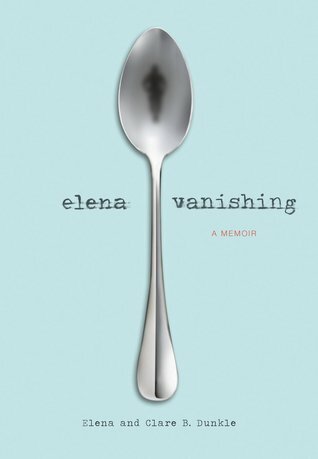 This was a good book to end the program with. The name "Egg Shakers" should be synonymous to the word "nirvana" or to the sound of your favorite rock band's concert intro or the songs of angels as the light of Heaven beams through fluffy clouds. The kids love them! I used bright red masking tape to create two lines that ran through the threshold of the storytime room doors. If they wanted to, children could test their balancing skills as they came into the room. I found this idea via Pinterest with a link to the blog Maya*Made and thought it'd be perfect for the program. I made he flames from colored printer paper (construction paper would also work). The children could go through the ring. Keep an eye out for little ones who can't step over a high bar, but also keep an eye one who won't noticed the top part and will bonk their head. Be warned and watch out for the over exuberant ones will cut the line! Safety is important! I love this flannel board. 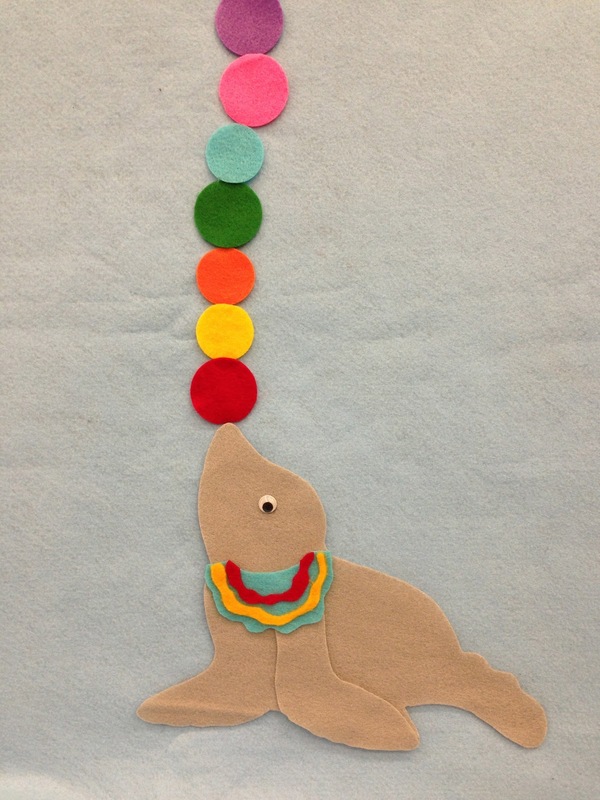 To make my little Sammy the Seal I found a printable online and enlarged it (he's approximately 8 inches across). For the collar I simply created a half circle with squiggly edges and I added squiggly stripes for some flair. As for his different colored balancing balls, I used a die cut that my library has on hand. The children (both Toddlers and Preschoolers) took turns placing the balls on top of each other. One thing you have to remember, especially if you have a lot of children in your program, to place Sammy at the bottom of your flannel board (I have an easel type, by the way) so that you have enough room for a very tall column of balls! The children loved this simple flannel activity and loved counting how many balls we got to balance on Sammy's nose! I saw this craft idea on Crafts for Kids ©'s MySpace page via Pinterest. It was so cute and it did not involve a clown. Everyone needs a snack when they go to the circus, so obviously we had to make some popcorn! 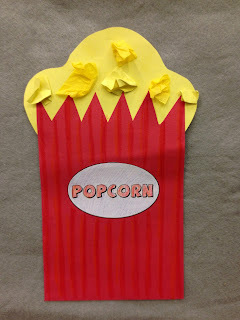 Instead of just gluing small pieces to resemble individual popped kernels I had the children squish up their little pieces to make them appear to be puffy popcorn. The parents loved this craft. I fell in love with the storytime theme "Stories in the Stars" from the blog A Bad Case of Books because it sounded so fantastical and lovely. I had to do a storytime. There weren't a lot of books that were specifically about stars that would be for the children who attended my storytimes so I had to flush out a little and include the moon. To create the perfect ambiance for my families, I taped die cut stars all over the storytime room walls, cabinet, and doors. I also included a smiling crescent moon on my flannel board. Everyone loved it! Everyone enjoyed the books, but the toddlers loved the flannel board activity and egg shakers. 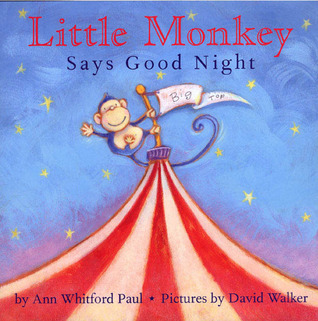 The preschoolers loved singing the song "If You're Gong to the Moon" because after going through the original lyrics the children got to create their own. We ended up singing about wear our pants and underwear before going to the moon. So silly! The toddlers and parents really enjoyed this book. The little ones that it was silly too! When we got to the page that I had to unfold the book to show how long Papa's ladder was the children were in AWE! This activity was at the very end of the Preschool Storytime. The children had to "catch" a star from the room decorations. These stars were used for their craft. They LOVED it! All of the children got to create their own starry night sky picture with special construction paper crayons (whoever thought up these crayons is a genius!) and to glue on their own stars. For the preschool group I added the element of glitter. Once they were done coloring they came to my table where they squiggled on some glue and we placed the paper into a box lid that lined with aluminum foil and had a thin layer of multi-colored glitter. This method with the box lid and foil liner worked amazingly well and resulted with no mess what.so.ever!